Use these tips as a grandparent guide and quick refresher on some important photography basics. Find out which automatic setting your camera might have for "children and pets" or similarly labeled feature. You'd be surprised how simple yet more effective your camera can become. Take a moment and figure out how it works if you haven't already. Make sure you have a memory card in your camera. Take some TEST shots in the room, part of the backyard or playground or site that you are going to try to take the photos at so you can see how the lighting and background may affect your photos. Be ready for short attention spans without having to stop and review to see how things are turning out and needing to make adjustments. Get down to their level. If they are on the blanket on the rug, you know what comes next! Join them! If they are in the pool, get low on the edge. If they are on a swing, sit your rear on the sand! Eye level makes for great shots. Make the effort. Get in very close. What features stand out to you? Little hands and feet are extremely cute and use some creativity for some fun angles with kids' first photos. Old school shots up against the garage door or backyard fence from twenty feet away will be things of the past. Pulling in close then moving in even further to smiling faces will yield some treasured photos. Make it fun to smile for the camera. Babies are unlike any other subjects. They are not ready to follow verbal directions and not able to react to your camera. Toddlers are busy exploring their new world and are easily distracted. "Terrible twos" and higher are terrible subjects when they feel the pressure to perform. What current toys or other helpful props can you be prepared with when your visitors arrive? Take a lot of photos. With today's digital cameras it can be an obvious tip but try taking multiple shots when the mood is right and resist the urge to stop and look at your camera between each shot. (Try your camera's "continuous" or "burst" feature where you press the shutter down and the camera automatically fires off several shots in a row.) Don't miss potential shots while you are messing around reviewing the other shots. Review them later, prioritize only the best (to prevent photo overload) and delete most of rest. Taking a lot of photos does not mean keeping the camera out and being a pest. "Hold it, stop, let grandma get another picture of you..." may build up some resentment when a child is in the middle of ripping open gifts and you cause giftus interruptus. Nothing is more discouraging than when a little one learns to say "no" and it kicks in everytime you take out your camera. 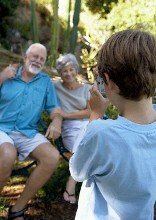 Limiting the time your camera is in your hand when family is visiting, yet grabbing some great shots may be the top of the grandparent guide list. Make deals for only three to four pictures when you have to and give a child an end goal that they can relate to when they are old enough to understand. Have them participate by letting you know what they might want a picture of them doing or which toy to include in the photo when their age permits.